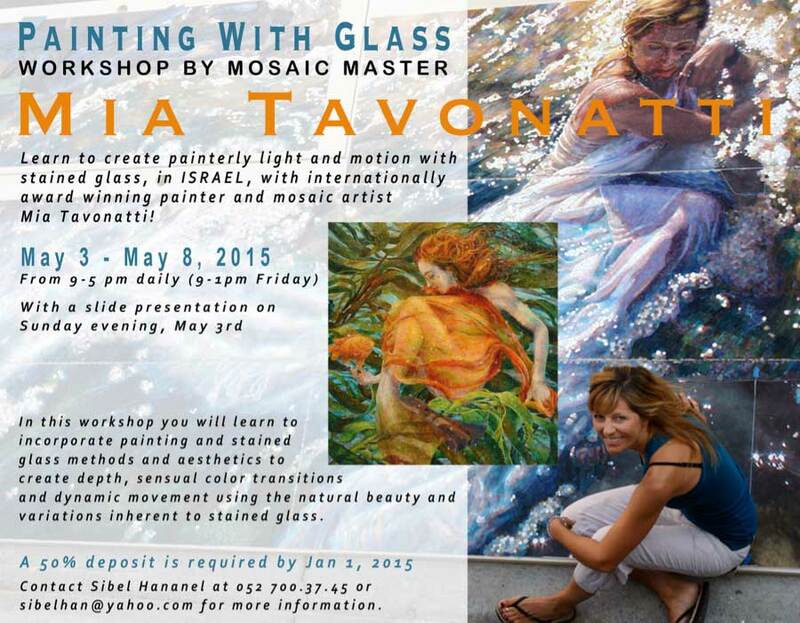 Announcing the international workshop of mosaic master Mia Tavonatti – “Painting With Glass” to be held in Israel! The workshop will be in the city of Maskeret Batia, which is conveniently located only 20 minutes by car from the center of Tel Aviv and 30 minutes from Jerusalem. Subject: Mia Tavonatti will be teaching how to create painterly light and motion with stained glass. Materials: Stained Glass, glue, substrate and all other materials are included in the workshop fee. • Stained glass and other materials (excluding your tools). • Slideshow presentation and discussion of Mia’s life and career as a professional painter / mosaic artist / teacher of twenty-five years. • She will also discuss examples of her work in relationship to design and color concepts she will be focusing on in this workshop. A reduced fee is available for those who do not need hotel accommodations and who opt out of the welcome dinner. Contact Sibel Hananel or Mia Tavonatti for further information.